The extensive range of UC San Diego’s rare and unique materials documenting the exploration, settlement, and development of the western United States provides researchers with a remarkable opportunity to explore the history and culture of the region, particularly the Southwest, the Pacific Coast, California, and San Diego. Collection strengths include sources for the study of people residing in and traveling through the area and the interaction of various populations with the land and the ocean. Holdings related to rural and urban development; mining, ranching, the cattle trade, and other business interests; water resources; political activism and human rights; and social and cultural activities can all be researched in depth. The types of research materials include printed books, manuscripts, personal archives, pamphlets, broadsides, maps, photographs, and ephemera. Utilizing these primary source materials, the history of the American West can be studied in its environmental, economic, political, and cultural contexts. Contemporary issues and political activism are also documented through the manuscript collections. The papers of Chicano activist and political organizer Herman Baca include extensive files on Chicano issues, organizations, individuals, and activities in the San Diego and the Mexican border region, as well as photographs documenting people and events. The United States-Mexico Border Program Records of the American Friends Service Committee describes human rights advocacy in the area, specifically the San Diego County - Mexico border. The main components of the records are abuse complaint files and legal case documents generated by citizens and immigrants in the years 1977-2000. The Ben Yellen Papers record the struggle for civil rights for farmworkers, both domestic and migrant, in the Imperial Valley. On a separate political front, the August S. Carstens Collection consists of materials relating to the movement opposing the construction and operation of nuclear power plants in California. The papers of San Diego journalists Neil Morgan, Lee Shippey, and Gerald Warren record the political and cultural issues of the city and region. 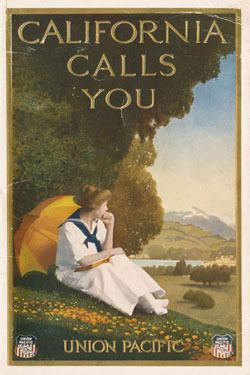 Printed books, directories, pamphlets, ephemera, promotional publications, newspapers, maps, and photographs provide additional context for the regional manuscript collections. Including but also extending beyond Southern California, the Jessie H. and John B. Goodman Collection includes extensive holdings on the Gold Rush, overland narratives, directories, and the later development of the state. The Hill Collection of Pacific Voyages, the preeminent collection of pre-1850 voyages of exploration and discovery to the Pacific, includes printed accounts of expeditions and travels to Alaska, California, and the Pacific Northwest; the holdings include first editions of the Lewis and Clark Expedition, Zebulon Pike, and explorations of the Northwest Passage. The Richard and Naomi Lingenfelter Western Mining Collection is an exhaustive gathering of works on all aspects of mining in the Western United States.